One of the most critical aspects of the golf swing is the position of the head and spine at set up and during the swing. This position is one of the most important aspects of predetermining impact and ball flight. Many instructors will tell you keeping the head steady with the proper spine angle tilt during the swing is a very important factor of mechanics, and it is. Others say some lateral motion is normal. In any case, head motion is hard to detect during the swing. 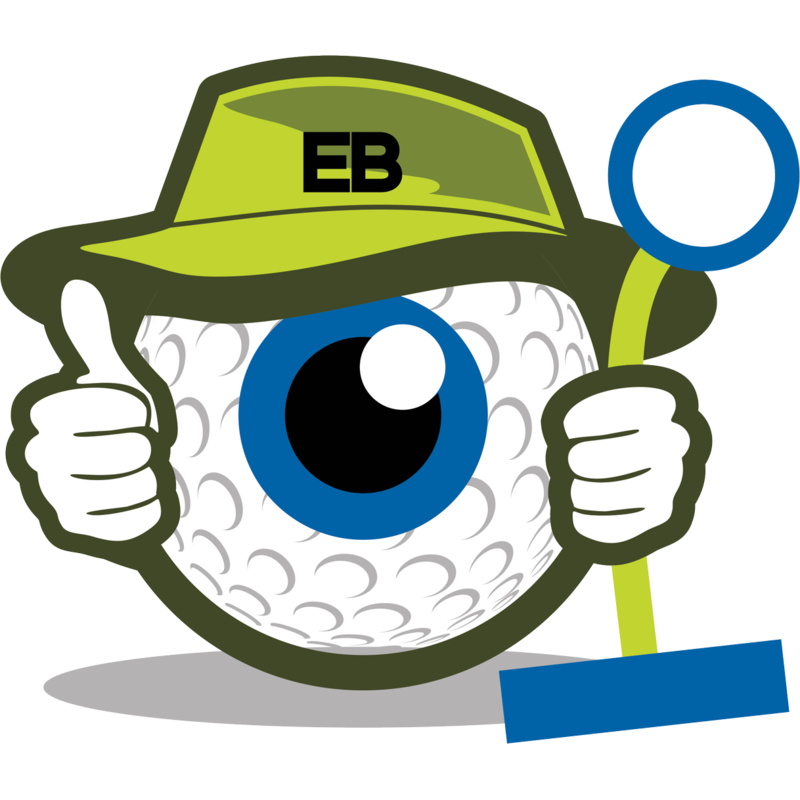 The Eyeball Golf Trainer enables you to see this motion very easily and accurately. There are 14 reasons why the Eyeball Trainer works! ————-For every club in your bag! BEN HOGAN – “Keep your head still” and “Watch the ball are some of the most widely heard pieces of golfing advice on the planet. The trouble, of course, is that they are usually uttered after a bad shot has been hit! What use is this? Almost none. Wouldn’t it be great if you could know, without the help of a coach, if your head really was quiet, and if you really were watching the ball as you approached impact? Wouldn’t it be great to know how it feels to do it right, so you can duplicate that feeling on the course. You cannot make a perfect golf swing without steadying your head, you need to find ways to do so! BOBBY JONES – Should your head ever get ahead of the ball, at any point in the swing, a poor shot will no doubt happen. JACK NICKLAUS – Any shifting of the head, at any point from address to impact will alter the arc and path of the swing. TOMMY ARMOUR – The cardinal principal of all golf shot making is that if you move your head, you ruin body action. HARVEY PENNICK – If you move your head forward during your down swing or through impact, you will hit a week ugly shot, you probably with hit a week pull slice. HANK HANEY – One of the most important lessons a junior player can learn is that a correct repeating swing happens around a fixed axis, the head. TOM WATSON – Steady your head. 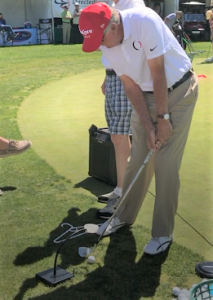 This thought will help your arms swing freely..
JIM FLICK – A steady head helps create a consistent bottom of the swing arc and angle of approach for each club. TIGER WOODS – I can’t stress enough the importance of a quiet head for solid ball striking and accurate iron play. However, you need to know when to release your head toward the target. I try to keep my head still on the backswing and downswing. DAVID LEADBETTER – Palmer was known for smashing the ball, but most people don’t realize that he had one of the steadiest heads in the game. This allowed him to stay in control of that powerful swing. He’s really wound up but his head is right where it started. 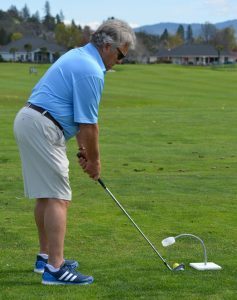 The Eyeball Golf Trainer, a head positioning tool, it works!